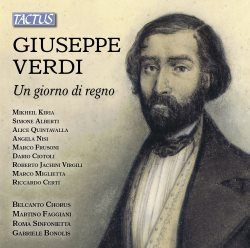 Un Giorno di regno was Verdi’s second opera, coming between Oberto, which it is hard to claim as much more than interesting, and Nabucco, a work whose blazing intensity ensures that it remains part of the repertory. It was his only overtly comic opera before Falstaff but at this stage in his development his main characteristic was a kind of urgency and ferocity which did not lend itself well to Rossinian comic opera. Perhaps he might have been able to accommodate its demands better if he had not been composing it shortly after the deaths of his wife and children. Live performances are rare but I very much enjoyed one at the Buxton Festival some years ago which showed that, given performers with experience of the comic operas of this period, it can work well on stage. Recorded performances are also few, although the considerable merits of that conducted by Lamberto Gardelli and including Jessye Norman, Fiorenza Cossotto and Jose Carreras in the cast might well make others think twice before attempting to rival it. Somewhat oddly that version does not appear to be available at present. An earlier version recorded in 1951 conducted by Alfredo Simonetto and including Lina Pagliughi, Renato Capecchi, Sesto Bruscantini and Juan Oncina in the cast has considerable vocal merits and despite drastic cuts and inevitably elderly-sounding recording it is no mere stopgap. There is also a DVD conducted by Donato Renzetti at Parma which looks very tempting but which I have not seen. I had high hopes for this new issue, especially as the cover indicates that it makes use of a new critical edition of the text edited for Chicago University Press and Ricordi by Francesco Izzo. I was therefore surprised to discover the same cruel cuts to the score found in earlier issues. It may be that these cuts follow the composer’s wishes which were not indicated in the earlier publication, whose vocal score runs to some 390 pages. In the absence of any further information on this I have to say that, for me at least, they alter the scale of the opera in a harmful way, reducing its impact, as similar cuts usually do in the operas of Rossini or Donizetti. This version is little different in this regard to the 1951 recording. I was also hoping to hear a version significantly better cast and recorded and in these respects I was even more disappointed as it is, if anything, less satisfactory than the 1951 version. The booklet note by Cesare Scarton states that “the reason for our revival of Un giorno di regno consists, above all, in the fact that it is the work of a young composer, and is suitable, because of its intrinsic vocal characteristics, for being performed by young singers, as in this recording”. I have to say on the basis of what is heard here, presumably in a live performance to judge by the desultory applause and occasional stage or other noises, that this seems wholly wrong. None of the singers has a voice of particular distinction or is able, possibly due to youthful inexperience, to make much of the opportunities their roles give them. The most obvious example is the big comic duet for two baritones which is a highlight of the 1951 version with Capecchi and Bruscantini but which is simply dull here. The tenor has obvious difficulties and the sopranos lack distinction. I suspect that I would have enjoyed it had I been present at the live performance but it does none of the performers any favours to perpetuate it in recorded form. The recording quality resembles a poor broadcast from many years ago making listening even less of a pleasure. Tactus have not made the issue more desirable by including only a synopsis rather than a libretto. Also there are no notes about the performers. I started to listen to these discs with real expectations but they were sadly never met.